The full name, the “Induro GIT304 Grand Series 3 Stealth Carbon Fiber Tripod” is quite the mouthful, but it does summarize what we should expect from this tripod. The GIT304 is from Induro’s line of systematic style tripods with exchangeable top plate, thus the “Grand Series” designation. The legs are indeed carbon fiber, but I have no idea what the ‘Stealth’ moniker means. Stealthy isn’t exactly the right term for a systematic tripod. As we will see though, the GIT304 is one of the most compact systematic tripods available. The test results are included here as I consider them to be part of the tripod’s specification. For full discussion of the stiffness and damping, see the test results page of the review. The specifications largely speak for themselves. The height is measured at 51.7″ versus the value listed from the manufacturer of 53.0″. This is a small difference but important in this range. It is the difference between having the camera at eye level or not, or how much you need to hunch over to look through the viewfinder. 51.7″ is on the short side for a systematic tripod. Most tripods in this category are a little taller. This isn’t necessarily a bad thing, but be aware before purchasing. 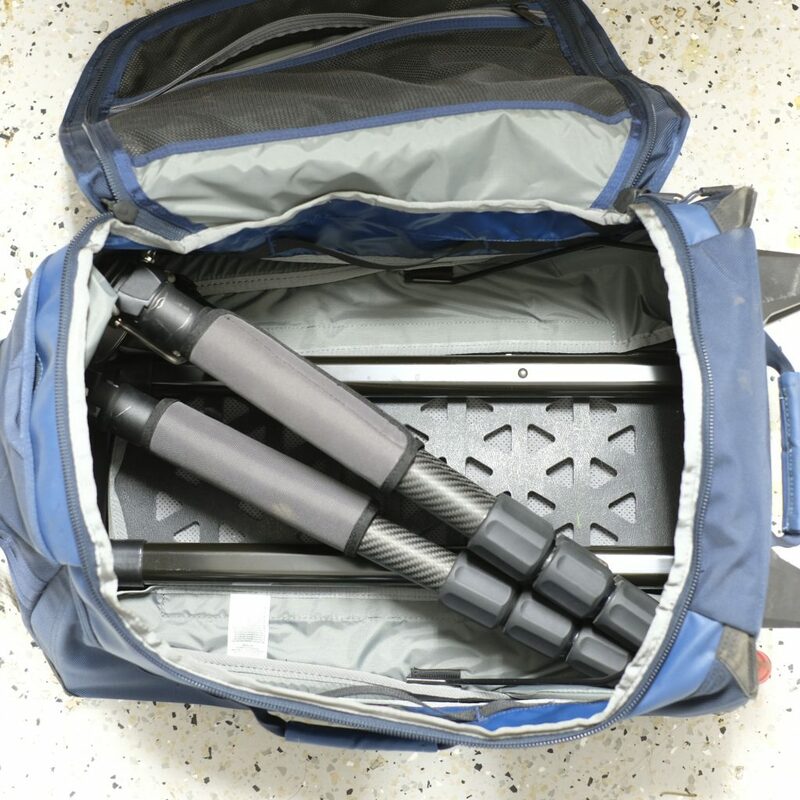 Because the tripod is on the shorter side and has four leg sections, it does pack up the smallest of any systematic style tripod I have tested, making it potentially suitable for carry-on baggage. The GIT304 gits comfortably into a maximum size carry on bag, though this is of course without an attached head. It takes up a considerable volume, so don’t expect to get much else in there. The GIT304 comes with a carrying case, a tool kit, and leg wraps. I find that everything except for the tool kit is rather unnecessary. The leg wraps provide comfort for the hands when using the tripod, and help protect the tubes. Fine, but not something that most people want. Similarly, the carrying case is of fine quality, and keeps all of the unnecessary accessories together in storage for when you aren’t using them. I would rather Induro didn’t include these and simply dropped the price.